L’Oréal Paris has launched a new ad campaign, promoting the Magic Retouch as the No. 1 Root Concealer in the world. 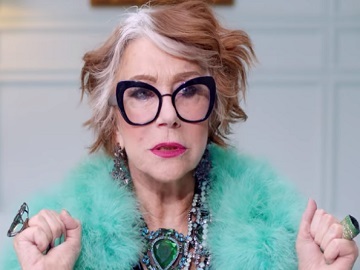 Titled “Are you ready to meet the #Rootsfamily?” the campaign debuted with a first episode, which introduces the Roots family – “a family with a serious root problem and a magic solution.” The first episode revolves around The Forgetful Matriarch, Maxine Root (played by Helen Mirren) – a forgetful eccentric lady, mother of Marilyn (Andie MacDowell) and her brother Maxwell (Jonathan Saxby). She has grey roots, but she also has a solution to get rid of those roots in just three seconds: Magic Retouch by L’Oréal Paris. The Roots family also includes Maxwell’s wife, Melinda Roots (Morena Baccarin), who is a drama queen and part-time philanthropist, Marilyn’s daughters – Meredith (Aja Naomi King) and Margaret Roots (Luma Grothe). The brand is marketing its Magic Retouch as “the perfect solution for concealing greys and roots with one quick spray”. With a lightweight, no-transfer formula, this root concealer features a pinpoint micro-diffuser that precisely targets greys and the rich colour pigments and give you perfectly blended coverage. The product is available in nine shades to match and blend with all leading shades, including salon colour, and it lasts untils washed out, up to 25 uses.